Solar power is the primary energy source fora California quarry caught between a rock and a hard place over changing electric rates. 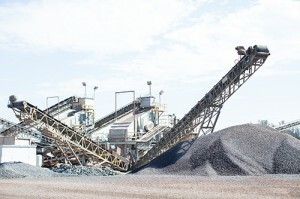 When increased electric rates tripled overnight in 2011, Mark Soiland, Stony Point Rock Quarry president and second-generation owner, knew his family’s California-based company had to find an alternative energy source. The rate change was due to Pacific Gas & Electric’s (PG&E) move to generate additional revenue. The California Public Utilities Commission eliminated an average rate limiter, which helped business owners keep energy costs at a manageable level. One impact of that change was removal of the cap on kilowatt-hour rates, which had governed power costs for businesses like Stony Point Rock Quarry. Their monthly electric bill went from an average of $8,500 to as high as $33,000. The Stone Point Rock Quarry’s solar system is 202 kW and made up of 33 AllSun dual-axis trackers that follow the sun throughout daylight hours. 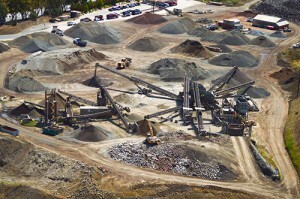 Stony Point Rock Quarry supplies products for construction and landscape companies, serving wholesale and retail customers for major construction projects and individual home landscaping needs. 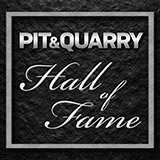 Their products, which include specialty items and custom mixes, are used for jobs of all sizes such as underground pipeline work, site work, road and driveway construction, septic system installation, building construction, concrete work, and landscaping improvements. The Soilands looked to North Coast Solar, a solar general contractor in Santa Rosa, Calif., to provide the information they needed to develop a new energy plan. 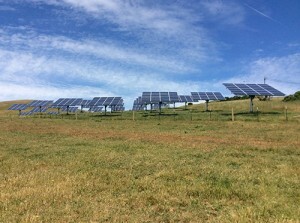 Brian Hines, North Coast Solar owner, worked with the Soilands to organize the project’s design, engineering, installation, utility interconnection and utility rebate processing. In analyzing Stony Point Rock Quarry’s electric rate history, Hines found that nearly 50 percent of its power costs were due to demand charges. Demand charges are based on the highest rate of energy use at any time during a billing period. 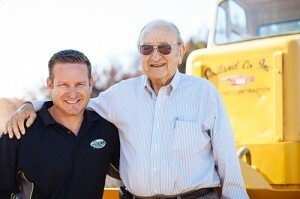 Owners Marv Soiland and his son Mark pose in front of the company’s very first tractor. The quarry’s solar system is 202 kW and made up of 33 AllSun dual-axis trackers that follow the sun throughout daylight hours. 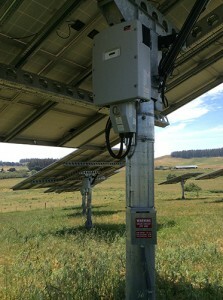 Each tracker has 24 ReneSola 255-watt modules and one SMA 6-kW inverter. Performance with the dual-axis tracker is 40 percent higher than with a fixed array. Overall, the system will generate more than 400,000 kilowatt-hours per year. 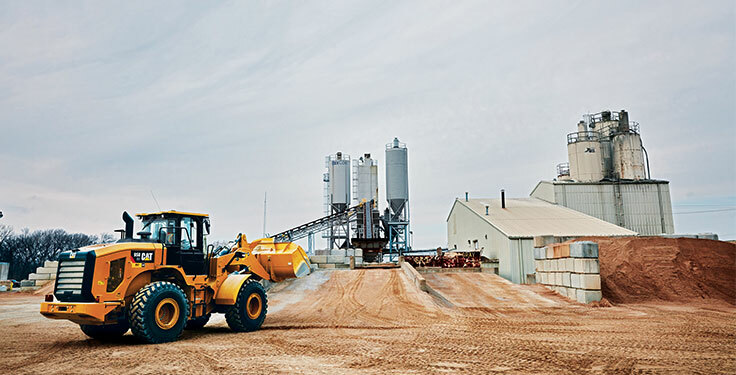 The company’s products are used for jobs of all sizes, such as road and driveway construction, concrete work and more. The project team for Stony Point Rock Quarry’s solar system includes installer North Coast Solar, Lunardi Electric, Harris Co. Concrete Construction, Dave Soiland Co., Northgate Ready Mix, RGH Geotechnical Consultants and ZFA Structural Engineers. Solar module costs have decreased dramatically over the last 10 years. Hines says a solar module that would have cost $1,000 in 2004 now sells for $250. Advances in inverters, which convert direct current electricity to alternating current electricity, also make the systems more affordable and efficient. Stony Point Rock Quarry’s solar modules have a manufacturer’s 25-year warranty. The rest of the system has a 10-year warranty. Soiland expects a seven- to eight-year return on investment on the solar system because of the savings the company is experiencing in power costs. The Stony Point Rock Quarry will receive about $50,000 over five years from the California Solar Initiative rebate. Wind power wasn’t an option for Stony Point. Wind studies in its area demonstrated that most significant wind events occur there during nighttime hours. Wind turbines there would also cause environmental concerns in regard to bird populations. In order to bank solar power, Soiland plans to install a stationary battery pack that will be online late this year. Over time, Stony Point Rock Quarry would like to triple or quadruple the size of the solar fields on available land. The expansion would allow the company to provide power for Sonoma Clean Power, the local power agency. 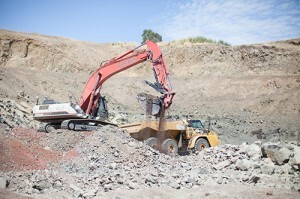 An excavator loads rock at the Stony Point Rock Quarry. 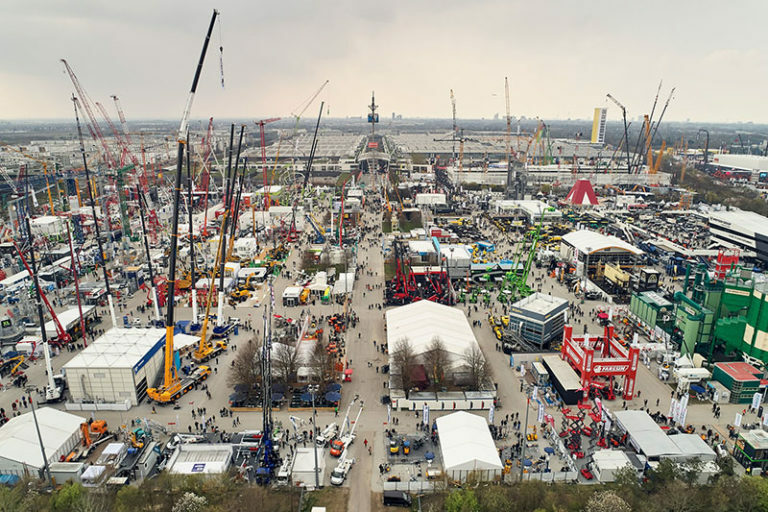 The company supplies products for construction and landscape companies, serving wholesale and retail customers for major construction projects and individual home landscaping needs. 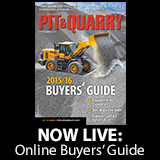 The quarry has been the center of much attention for its innovative power solution. From the feedback they’re receiving, the Soilands believe the general public sees the development as a very positive development. “Travelers on the public thoroughfare can see the system from the highway,” Soiland says. “No one in this area has seen anything like it before. As far as we know, it’s the only system like it that’s been installed on the West Coast. A solar module that would have cost $1,000 about 10 years ago now sells for $250 according to Stony Point’s Mark Soiland. Loretta Sorensen is a freelance writer in Yankton, S.D. She produces material on a variety of topics, serves as a ghostwriter, and has authored her own books.